We just received our first Illumivein Vein Finding Flashlight and have had much success with it so far. 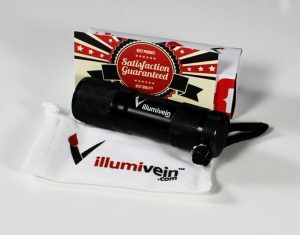 For those of you who don’t know, the Illumivein is the first affordable vein finder or transilluminator on the market. It casts a special unique light that will illuminate the veins beneath your skin. The special light is naturally absorbed by a person’s blood to cast a dark visible shadow. It’s 100% safe and so far has shown us to be very useful. As a practicing Registered Nurse, I consider myself to be an expert what it comes to phlebotomy and IV’s. On occasion, I run into people that you cannot ever find a vein on. You know, those people who are very edematous, bariatric, renal failure, those with an arm precaution and their only usable arm has been stuck a million times. This is only to name a few. When using the Illumivein, you want to dim the lights as much as possible. The darker the better. Gently press the light against the skin and search from side to side. With proper positioning, you will see a dark shadow like figure of the veins. Now that you have been able to identify a good vein, you can continue to carry out your blood draw or IV stick. The device is not needed in every single situation but when you do find yourself in one you will not regret your purchase. Ideal for nurses, phlebotomists, nurse aides, CNA’s, PCA’s, EMTs, medics, and more. At $24.99 retail, you get one device and a one of a kind velvet carrying pouch. The Illumivein utilizes the same technology of other vein finders or transilluminators on the market. Those devices go for $200-$2,000 which is way more than the typical person can afford. For a low price, you can expect similar results. Visit http://www.illumivein.com for more information.